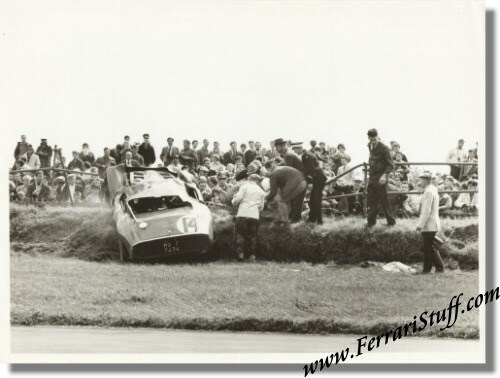 Vintage 1963 Photo Sequence, Ferrari 250 GTO S/N 3647GT, crashed at the Tourist Trophy, Goodwood. 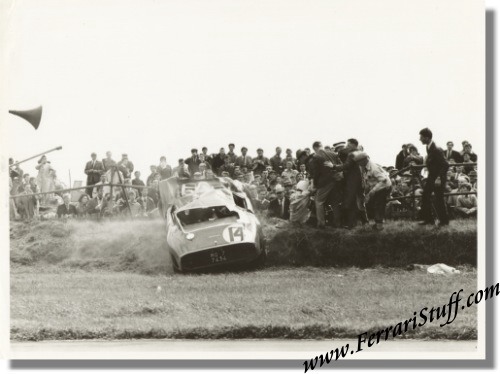 This is a vintage 1963 photo sequence of Tommy Hitchcock just having crashed the Ferrari 250 GTO of Prince Zourab Tchkotoua during the 1963 Tourist Trophy at Goodwood. 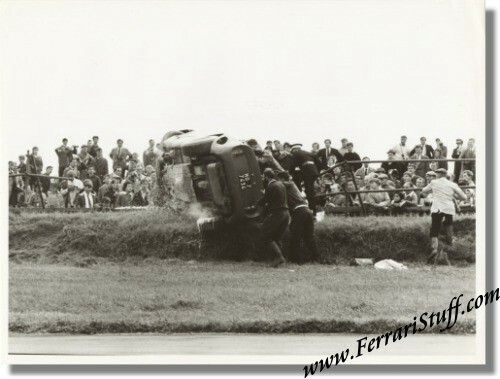 Hitchcock did more or less the same thing some 3 months earlier when he put the same car on its roof during the Nurburgring 1000 KM. 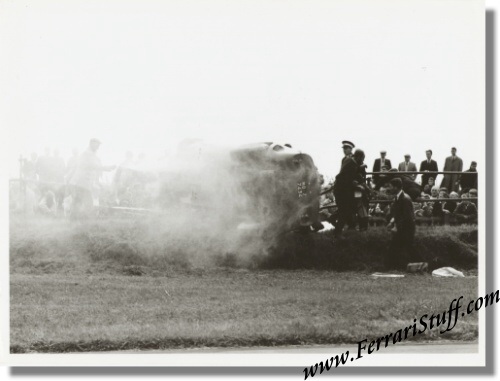 The car in question is S/N 3647 which of course survives to this day. All 6 photos are vintage prints, i.e. printed shortly after the original image was captured on film and were shot by the same photographer. Each photo measures some 22 x 16.5 cm or 8.7 x 6.5 inches. The back carries the photographer's stamp along with a lot of scribbling. The car on it's side in the barriers with the first rescue men arriving on the scene. The car is blowing a lot of steam and Hitchcock is trapped inside. More aid has arrived and the first attempts to put the car back on its wheels are being made. Hitchcock is still inside and the engine appears to be running still (straw particles flying up under the car). 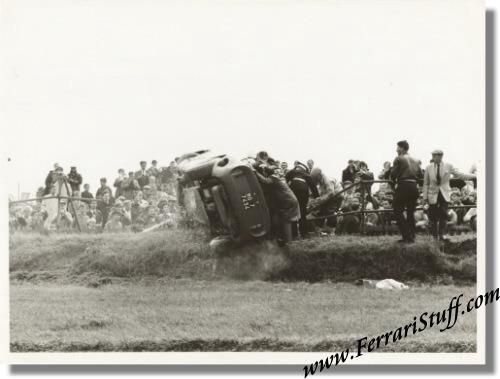 The cars is back on its wheels and Hitchcock has been dragged from the wreckage. Now the severe damage to the upper structure of the car is clearly visible. Hitchcock is sitting upright next to the wreckage. The car is still blowing steam. Hitchcock is being hand-carried away (NO stretcher!) and a large piece of Plexiglas (? ), probably the rear window, is being picked up. 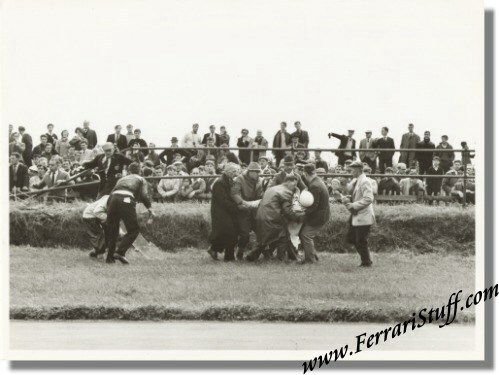 Truly a unique set of contemporary "documents" on a very important Ferrari and a unique happening!